4382. Mary Rossiter PALMER (Lucy WHEELER , Thomas WHEELER , Thomas WHEELER , Mary MINER , Ephraim MINER , Ephraim MINER , Grace PALMER , Walter ) was born 10 Aug 1800 in Stonington, New London Co., Connecticut. Mary married Noyes PALMER, son of Noyes PALMER Jr. and Dorothy STANTON, on 27 Sep 1824. Noyes was born 20 Apr 1790. He died 18 Feb 1969. 5988 M i Noyes Stanton PALMER is printed as #4364. 5989 M ii Henry M. PALMER is printed as #4365. 4383. Alden PALMER (Lucy WHEELER , Thomas WHEELER , Thomas WHEELER , Mary MINER , Ephraim MINER , Ephraim MINER , Grace PALMER , Walter ) was born 17 Jul 1802 in Stonington, New London Co., Conn..
Alden married Nancy D. PALMER, daughter of Lemuel PALMER and Abigail DAVIS, on 10 Oct 1831. Nancy was born 22 Feb 1810. Harriet J. PALMER was born 28 Jul 1832. She died 4 Jun 1884. Mary R. PALMER was born 16 Mar 1834. Mary married Henry M. PALMER, son of Noyes PALMER and Mary Rossiter PALMER. Henry was born 19 Feb 1829. Thomas PALMER was born 13 Aug 1835. Alden PALMER was born 14 Sep 1837. Lucy W. PALMER was born 28 Dec 1839. Eugene PALMER was born 29 Nov 1841. Emeline PALMER was born 3 Mar 1846. Emeline married Noyes Stanton PALMER, son of Noyes PALMER and Mary Rossiter PALMER. Noyes was born 29 Mar 1826. Eliza Babcock PALMER was born 11 Jun 1849. Eliza married Franklin Wheeler PALMER, son of Noyes PALMER and Harriet WHEELER. Franklin was born 18 Mar 1845. 4390. Eliza P. WILLIAMS (Lydia WHEELER , Thomas WHEELER , Thomas WHEELER , Mary MINER , Ephraim MINER , Ephraim MINER , Grace PALMER , Walter ) was born 18 Jan 1801 in Stonington, New London Co., Connecticut. She died before 1860. STONINGTON BRANCH OF THE DESCENDANTS OF ALLEN BREED, p. 240. STONINGTON BRANCH OF THE DESCENDANTS OF ALLEN BREED, p. 246. Eliza P. Williams, b. Jan. 18, 1801, dau. of William and Lydia (Wheeler) Williams. She m. (2) Oct. 7, 1834 Erastus Edgecomb of Stonington. She died bef. 1860 when her 2nd husband married again. Eliza married (1) Samuel BREED, son of Samuel BREED and Eunice ALLYN, on 1822. Samuel was born 19 Aug 1790 in Stonington, New London Co., Connecticut. He died 9 Feb 1826/1827 in Stonington, New London Co., Connecticut and was buried in Old Breed Cemetery, Stonington, New London Co., Connecticut. Samuel-7 was enlisted in the War of 1812. VITAL RECORDS OF STONINGTON, CT, Vol. 3, page 227. Here are stones for two of sons of Capt. John, Jr., Samuel (1765-1827) and Roswell (1776-1844) and for the two wives of Samuel, Eunice Allyn and Mary Sheffield, and the two wives of Rosewell, Sarah Ann Hancox and Priscilla Chesebrough. The names of three of Samuel's children are on the stones: Samuel who died in 1827, shortly before he did, at the age of 36, and two daughters by his second wife; Eunice A., who died in 1854 at the age of 45, and Harriet B. who died in 1849 at the age of 42. The deaths of two young children of Samuel Jr. and his wife and his wife Eliza are also recorded here. Samuel-7 Breed, b. Aug. 19, 1790, m. 1822, Eliza P. Williams. Samuel-7 Breed, b. Stonington, Aug. 18, 1790, m. Nov. 21, 1822, Eliza P. Williams, b. Jan. 18, 1801, dau. of William and Lydia (Wheeler) Williams. He died Feb. 9, 1826, and she m. (2) Oct. 7, 1834 Erastus Edgecomb of Stonington. She died bef. 1860 when her 2nd husband married again. 5998 M i Samuel Edwin BREED is printed as #4179. 5999 F ii Lucy Palmer BREED is printed as #4180. 6000 F iii Ann Elizabeth BREED is printed as #4181. Eliza also married (2) Erastus EDGECOMB on 7 Oct 1834 in Stonington, New London Co., Connecticut. Erastus Edgecomb of Stonington. He married again in 1860. 4405. John Holmes WHEELER (Isaac WHEELER , Isaac WHEELER , Isaac WHEELER , Mary MINER , Ephraim MINER , Ephraim MINER , Grace PALMER , Walter ) was born 6 Nov 1795 in Stonington, New London Co., Connecticut. He died 21 Dec 1867 in New London, New London Co., Connecticut. THE WHEELER FAMILY IN AMERICA,THE DESCENDANTS OF THOMAS WHEELER, STONINGTON, CONN., pages 289 through 349, by Inez E. Coolby-Brayton, 1934. Located in the DAR Library, Washington, DC. He was a teacher and an active Abolitionist. John married Esther Hill BUDDINGTON on 22 Nov 1821. + 6001 M i John Ozias WHEELER was born 24 Nov 1823. + 6002 M ii Horace Z. WHEELER was born 25 Sep 1824. 4411. Thomas Jefferson WHEELER (Isaac WHEELER , Isaac WHEELER , Isaac WHEELER , Mary MINER , Ephraim MINER , Ephraim MINER , Grace PALMER , Walter ) was born 9 Jan 1812 in Stonington, New London Co., Connecticut. Thomas married (1) Amelia CHESEBROUGH, daughter of Rev. Elihu CHESEBROUGH and Lydia, on Oct 1843. Amelia was born 17 Jul 1809. Thomas Allen WHEELER was born 18 Nov 1844 in Stonington, New London Co., Connecticut. Thomas married Ellen J. DAVIS on 30 Mar 1870. Thomas also married (2) Sophia CHESEBROUGH, daughter of Elias CHESEBROUGH and Lucretia PALMER. Sophia was born 31 Jan 1809. Thomas also married (3) Almira PHILLIPS. Thomas also married (4) Mary DENISON. Mary was born 8 Jun 1813. 4413. Stiles Denison WHEELER (Isaac WHEELER , Isaac WHEELER , Isaac WHEELER , Mary MINER , Ephraim MINER , Ephraim MINER , Grace PALMER , Walter ) was born 13 Mar 1815 in Stonington, New London Co., Connecticut. He died 29 Aug 1884 in Stonington, New London Co., Connecticut. 1870 CENSUS - STONINGTON, NEW LONDON CO., CONN., 2 Jun 1870, by Gurden S. Crandall, page 782A, Dwelling #47, Family #49. WHEELER, Stiles D., 55, M, W, Farmer, $6,000, $1,200, CT.
WHEELER, Sarah, 41, F, W, Keeping House, RI. WHEELER, Calvin, 23, M, W, Laborer, CT.
WHEELER, Courtland, 20, M, W, Laborer, CT.
Stiles married Sarah Elizabeth BRIGGS, daughter of Jedediah BRIGGS and Frances ALBRO, on 12 Mar 1846 in Stonington, New London Co., Connecticut. Sarah was born about 1829 in Rhode Island. + 6004 M i Calvin WHEELER was born 19 Feb 1847. Courtland WHEELER was born 1850 in Connecticut. 4416. 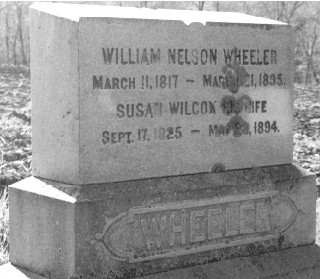 William Nelson WHEELER [scrapbook] (Isaac WHEELER , Isaac WHEELER , Isaac WHEELER , Mary MINER , Ephraim MINER , Ephraim MINER , Grace PALMER , Walter ) was born 11 May 1817 in Stonington, New London Co., Connecticut. He died 21 Mar 1895 in Norwich, New London Co., Connecticut and was buried in Franklin Plain Cemetery, Franklin, New London Co., Connecticut. William Nelson Wheeler and Susan Wilcox were duefully united in marriage 29 th of Oct 1843, by A.G. Palmer, Paster of the Baptist Church of Stonington Bors. 1870 CENSUS - STONINGTON, NEW LONDON CO., CONN., 2 Jun 1870, by Gurden S. Crandall, page 782A, Dwelling #51, Family #59. WHEELER, Wm. N., 53, M, W, Farmer, $5,000, $1,000, CT.
WHEELER, Susan, 44, F, W, Keeping House, CT.
WHEELER, Alice, 20, F, W, At Home, CT.
WHEELER, Daniel, 18, M, W, At Home, CT.
WHEELER, Agnes, 16, F, W, At Home, CT.
WHEELER, Amos, 13, M, W, At Home, CT.
WHEELER, George, 11, M, W, At Home, CT.
WHEELER, Mary, 8, F, W, At Home, CT.
WHEELER, Woodward, 6, M, W, At Home, CT.
WHEELER, Ira, 4, M, W, At Home, CT.
WHEELER, Sarah A., 1, F, W, At Home, CT.
VITAL RECORDS OF FRANKLIN, CONN.
William N. Wheeler, place of death Bean Hill, Norwich, CT, date of death March 21, 1895, Reisdence Norwich, Conn, Farmer, 78 years, Birthplace Stonington, Conn.
William married Susan WILCOX, daughter of Captain Phineas WILCOX and Mercy TAYLOR, on 29 Oct 1843 in Stonington, New London Co., Connecticut, by A. G. Palmer, Paster of the Baptist Church of Stonington. Susan was born 17 Sep 1825 in Stonington, New London Co., Connecticut. She died 28 May 1894 in Franklin, New London Co., Connecticut and was buried in Franklin Plain Cemetery, Franklin, New London Co., Connecticut. CERTIFIED COPY OF DEATH RECORD, CONNECTICUT STATE DEPT OF HEALTH. Susan Wheeler, F, age 68, May 28, 1894, New London, Franklin, born Stonington, Conn., married, father Phineas Wilcox, mother Mercy Wilcox, from heart disease. Alice WHEELER was born about 1850 in Stonington, New London Co., Connecticut. Daniel WHEELER was born about 1852 in Stonington, New London Co., Connecticut. Agnes WHEELER was born about 1854 in Stonington, New London Co., Connecticut. George WHEELER was born about 1857 in Stonington, New London Co., Connecticut. Mary WHEELER was born about 1862 in Stonington, New London Co., Connecticut. + 6011 M vi Nelson Woodward WHEELER was born 9 Aug 1864 and died 17 Mar 1926. Ira WHEELER was born about 1866 in Stonington, New London Co., Connecticut. Sarah A. WHEELER was born 1869 in Stonington, New London Co., Connecticut. 4443. John HOLMES IV (Ruth WHEELER , Isaac WHEELER , Isaac WHEELER , Mary MINER , Ephraim MINER , Ephraim MINER , Grace PALMER , Walter ) was born 15 Oct 1798 in New London Co., Connecticut. He died 3 Jan 1872 in Jewett City, New London Co., Connecticut. John married Nancy Angeline WILLIAMS, daughter of Isaac WILLIAMS Jr. and Nancy AVERY, on 10 Mar 1830. Nancy was born 19 Nov 1804 in Stonington, New London Co., Connecticut. She died 21 Jan 1835 in Stonington, New London Co., Connecticut. Elias Atwood HOLMES was born 25 Aug 1832 in New London Co., Connecticut. He died 4 Jun 1865. Elias married (1) Laura Homes WICKWIRE on 27 Nov 1853. Elias also married (2) Sybil Ann BURDICK on 4 May 1862. Sybil was born 19 Dec 1832. She died 5 Oct 1868 in Jewett City, New London Co., Connecticut. William Williams HOLMES was born 14 Sep 1834 in New London Co., Connecticut. He died 12 Jan 1835 in New London Co., Connecticut. 4457. Esther Wheeler HULL (Amos HULL , Anna WHEELER , Jeremiah WHEELER , Mary MINER , Ephraim MINER , Ephraim MINER , Grace PALMER , Walter ) was born 13 Sep 1807 in Stonington, New London Co., Connecticut. VITAL RECORDS OF NORTH STONINGTON, NEW LONDON CO., CONN., Book 1, page 52. HULL, Esther, daughter of Amos & Esther, b. Sept. 13, 1807. Esther married Russell WHEELER, son of Hosea WHEELER and Bridget GRANT, on 1 Oct 1827 in Stonington, New London Co., Connecticut. Russell was born 20 Aug 1796 in Stonington, New London Co., Connecticut. He died 8 Jul 1856 in Stonington, New London Co., Connecticut. 6016 M i Russell WHEELER is printed as #4504. 6017 F ii Martha WHEELER is printed as #4505. 6018 F iii Ann Elizabeth WHEELER is printed as #4506. 4473. Edwin Saxton WHEELER (Robert WHEELER , Bridget WHEELER , Jeremiah WHEELER , Mary MINER , Ephraim MINER , Ephraim MINER , Grace PALMER , Walter ) was born 17 Jun 1844 in No. Stonington, New London Co., Connecticut. He has an M.A. at Yale College, 1886. Edwin married Ella Marian WELCH, daughter of Harmanus M. WELCH and Antoinette PIERCE, on 12 Jan 1870 in New Haven, New Haven Co., Connecticut. Ella was born 12 Aug 1845 in Plainville, Windham Co., Connecticut. She died 24 Nov 1898 in Boston, Suffolk Co., Massachusetts. + 6019 M i James Everett WHEELER was born 24 Dec 1870. + 6020 F ii Grace Welch WHEELER was born 27 Jun 1872. 4486. Mary Ann WHEELER (Asa WHEELER , Hosea WHEELER , Jeremiah WHEELER , Mary MINER , Ephraim MINER , Ephraim MINER , Grace PALMER , Walter ) was born 27 Jun 1800 in Stonington, New London Co., Connecticut. Mary married Roswell Randall AVERY, son of Stephen AVERY and Anna WHEELER, on 19 Apr 1818 in No. Stonington, New London Co., Connecticut. Roswell was born 5 Nov 1791 in Stonington, New London Co., Connecticut. THE GROTON AVERY CLAN, Vol. I, by Elroy McKendree Avery and Catherine Hitchcock (Tilden) Avery, Cleveland, 1912. Found in the DAR Library, Washington DC. Page 287 & 433. He was a sergeant of militia in the war of 1812. (Conn. Men in War of 1812, page 7, where he is called Russell R. Avery); ensign of 7th co., 8th reg't, 1816 (Ms. State Papers, Hartford, Conn.) He later moved to Norwich, New York. VITAL RECORDS OF NORTH STONINGTON, NEW LONDON CO., CONN., Book 1, page 1. AVERY, Roswell Randall, son of Stephen & Anna, b. Nov. 5, 1791. 6021 F i Mary Ann AVERY is printed as #4525. 6022 F ii Cornelia Culver AVERY is printed as #4526. 6023 F iii Rebecca Wheeler AVERY is printed as #4527. 6024 F iv Emma Wheeler AVERY is printed as #4528. 4487. Ede Denison WHEELER (Asa WHEELER , Hosea WHEELER , Jeremiah WHEELER , Mary MINER , Ephraim MINER , Ephraim MINER , Grace PALMER , Walter ) was born 22 Oct 1803 in Stonington, New London Co., Connecticut. She died 3 Aug 1837 in No. Stonington, New London Co., Connecticut. VITAL RECORDS OF NORTH STONINGTON, NEW LONDON CO., CONN., Book 1, page 86. WHEELER, Ede D., m. Charles G., both of N. Stonington, Nov. 4, 1823, by William Randall, Jr., J.P.
Ede married Charles Grandison AVERY, son of Stephen AVERY and Anna WHEELER, on 4 Nov 1823 in No. Stonington, New London Co., Connecticut, by William Randall, Jr., J. P.. Charles was born 9 Apr 1796 in Stonington, New London Co., Connecticut. He died 6 Sep 1837 in No. Stonington, New London Co., Connecticut. THE GROTON AVERY CLAN, Vol. I, by Elroy McKendree Avery and Catherine Hitchcock (Tilden) Avery, Cleveland, 1912. Found in the DAR Library, Washington DC. Page 287 & 434. He was a farmer. Two other children not listed died in infancy. AVERY, Charles G., m. Ede D. Wheeler, both of N. Stonington, Nov. 4, 1823, by William Randall, Jr., J.P.
6025 F i Harriet W. AVERY is printed as #4529. 6026 M ii Charles Grandison AVERY is printed as #4530. 6027 M iii Cyrus Wheeler AVERY is printed as #4531. 6028 F iv Almira W. AVERY is printed as #4532.